My career in the AEC industry has brought me into the forefront of a modern revolution in how buildings are designed and constructed. It involves the integration of processes and technologies. While the change is just getting started, the buzz in the industry seems to be everywhere. The change acronyms of highest importance are BIM and IPD. They are Building Information Modeling and Integrated Project Delivery respectively. So why are these emerging now with such significance? The answer is waste elimination. The AEC industry the has been fracturing in practice since the 40’s-50’s when one or few companies took building projects from concept to completion. It is much different today. The modern AEC supply chain has become one of specialized building disciplines, companies, industries and educational campus’. Builders and owners have had to mirror this fracturing with contracts. Separate multi-contact awards per building that are potentially redundant in responsibility or simply gaped. A popular term in describing the resulting segmented activity has referred to this as a “silo”. One unfortunate result of silo’s was software. The software technologies that code for these different building disciplines have evolved to specialize over the years. To a point were not only did team A not consult team B, they were unable to exchange data if they did talk because the file platforms were not interoperable. 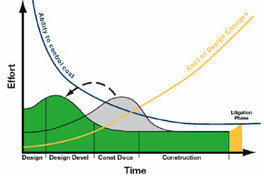 It was an inefficient way of working yet became so common that not many complained until a landmark study in 2004 that suggested what this might be costing the U.S.
…report recently released by NIST (National Institute of Standards and Technology) that puts an actual tag on the cost of inadequate interoperability will touch a nerve with AEC professionals—the estimate is $15.8 billion per year! I was very fortunate to be working with my current firm at the time of this report as they were approached by a progressive client and they themselves ready to invest in BIM technology. While so many early BIM case studies published mixed results dispite the eye-candy, they failed to produce the savings during construction. The AE company I work for teamed with a construction manager in a unique shared-incentive agreement with the Owner and sub-contractors to collaborated on a BIM model. This is long before anyone had ideas about IPD contracts. It was in fact “integrated” with every stakeholder together in one building each day of design and detailing. A formula that proved very successful in savings in the catagorie know as First Cost. Many of the BIM/IPD projects since have been published or awarded and can be found online. That is the typical extent of marketing as a AE firm. However, software companies go to greater extent to show off. So a good example is Autodesk’s documentation of how both BIM and IPD are requirements for addressing waste in first cost of building life-cycle. Notice in this video how fabrication opportunities are enabled once solid commitment to change is adopted.